*Facility fee & sales tax included in the above stated ticket prices. Additional Fees will be applied when purchasing online through Ticketmaster. 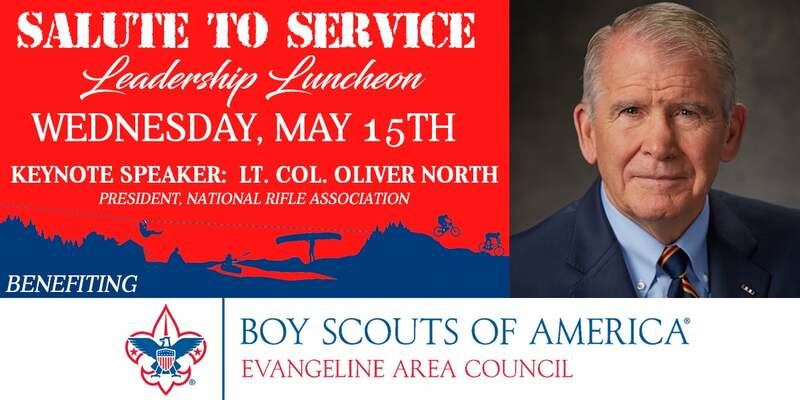 The 2019 Boy Scouts of America presents The Salute to Service Leadership Luncheon featuring Lt. Col. Oliver North benefiting Boy Scouts of America Wednesday, May 15th at 12noon in the CAJUNDOME Convention Center. ONSALE NOW: @chrisyoungmusic #RaisedOnCountry Tour with special guests @thechrisjanson and @LOCASH will be coming to the #CAJUNDOME on September 5, 2019!⁣ ...⁣ Tickets are on sale now at the link in our bio! Please note: Our Administrative Office and Box Office are closing now, for the safety of our staff, due to the severe weather! ... We hope everyone has a safe and happy Easter holiday! 🗣️JUST ANNOUNCED🗣️⁣ @chrisyoungmusic #RaisedOnCountry Tour with special guests @thechrisjanson and @LOCASH will be coming to the #CAJUNDOME on September 5, 2019! Tickets go on sale this Friday, April 19 at 10AM. Visit www.cajundome.com for more information. 🎂BIRTHDAY PARTY GROUP RATES!🎂⁣⠀ Celebrate your birthday boy/girl this year at the #CHSF19 with a party they (and their friends) won't soon forget!⁣⠀ ...⁣⠀ Parties include: admission into the Fair, ride wristbands, a party tent with seating for your group, hot dog or jambalaya meals for your guests & a birthday treat for the guest of honor! Check out all of the options on the attached flyer! ...⁣⠀ This year's Cajun Heartland State Fair runs May 23 - June 2! GIVEAWAY ALERT: Miranda Lambert’s coming to the #CAJUNDOME this fall, with special guests Maren Morris, Pistol Annies, and Tenille Townes. Tickets go on sale this Friday, 4/12, at 10AM. We want to give YOU the chance to WIN 'EM BEFORE YOU CAN BUY 'EM! ... For your chance to win 2 TICKETS to the show, visit the pinned post on our Facebook page! ... Our contest ends April 11 at 12:00 PM at which time one winner will be drawn at random from the qualified entrants. Winner must be 18 years of age or older and able to pick up the prize from our Box Office. Good luck! Just under 3⃣weeks before @wbsuperseries takes over the #CAJUNDOME and you will want to be here! ... Grab your tickets for April 27 at the CAJUNDOME Box Office or at the link in our bio! NEW SEATS JUST RELEASED for Lynyrd Skynyrd’s Last of the Street Survivors Farewell Tour with Hank Williams Jr. and Tucker Beathard - coming to the #CAJUNDOME on May 18!⁣ ...⁣ Grab your tickets now at the CAJUNDOME Box Office or at the link in our bio! The #CAJUNDOME and the #CHSF19 are in search of a boiled crawfish vendor for the Cajun Heartland State Fair! Tag your favorite crawfish spot that you'd love to see at the Fair! Keeping it rolling with Kid N Play!